Every so often a recording artist comes along who's unlike anyone else. That was certainly the case this week in 1984 when a bright-haired, crazily-dressed, distinctly voiced singer arrived on the ARIA chart with her debut single. Not only would she make 1984 that little bit brighter - OK, a lot brighter - but she'd quickly prove she was anything but a novelty. She established herself as a serious star by flying straight to the top of the top 50. At the top of the singles chart this week in 1984 was the song that our new arrival would dethrone from number 1. "Love Is A Battlefield" by Pat Benatar spent its third week on top. His first chart appearance since the original reggae remake of "Wild World" (number 31 in late 1970/early 1971), "Reggae Night" was co-written (and later recorded) by La Toya Jackson. A flop in Australia, the US and the UK, this follow-up to "Undercover Of The Night" is best remembered for its video featuring a temptress played by musical theatre and film actress Anita Morris. What a complicated backstory this record has. The second major socially conscious hip-hop hit following "The Message" by Grandmaster Flash & The Furious Five, "White Lines (Don't Don't Do It)" was performed by Furious Five rapper Melle Mel. Despite the credit on the track, Grandmaster Flash had nothing to do with it - and "Grandmaster" was either used a) to fool the public into thinking he was involved, b) due to a royalty dispute between Grandmaster Flash and Sugar Hill Records, or c) because Melle Mel had started calling himself Grandmaster Melle Mel and the two went to court over the title. A further complication came from the fact that the song's bassline was taken from "Cavern" by Liquid Liquid, which led to more legal wranglings. Released in the wake of The Furious Five breaking up, "White Lines..." had a clear anti-drug message, although another story suggests that it was originally written to endorse the cocaine lifestyle and "don't don't do it" was added later. Either way, its socially responsible lyrics continued hip-hop's shift from being just party music, and paved the way for more political acts like N.W.A. and Public Enemy. Teamed with a music video shot by Spike Lee, who was a film student at that stage, the song didn't quite make the Billboard Hot 100 but it's an undisputed classic, so much so that Duran Duran made the disastrous decision to record their own version on covers album Thank You in 1995. From a track covered years later, we come to a song that had two versions out simultaneously - because one just wasn't enough! Although the good thing about there being two separate recordings of this tribute to The Three Stooges is that it may well have prevented either from being a very big hit. Original artists Jump 'n The Saddle had a US top 20 with their swing-style novelty tune and we'll see the Canadian remake in a couple of weeks' time. Bet you can't wait! His last single had topped the chart for six weeks over summer, but Lionel Richie had to make do with a top 30 berth for the second track released from Can't Slow Down. And I don't think the lack of success for "Running With The Night" can be blamed on people buying the album instead - although they did - since third single "Hello" also topped the chart. Guess "Running With The Night" just didn't connect in the same way as the singles released either side of it. As for Can't Slow Down, it continued to spend quite a bit of time inside the top 10, leading up to three weeks on top in June. It also ended 1984 as the year's number 1 album. It'd been his second single back in 1982 and failed to make an impact, but now Paul Young had a couple of hits under his belt, his version of "Love Of The Common People" was re-released and did the business this time around. 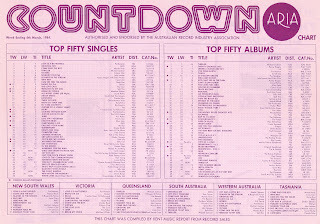 Recorded by about 500 different artists - OK, slight exaggeration - in the late '60s and early '70s, the song about a family living on the poverty line had never reached higher than number 70 in Australia. That version was released by The Everly Brothers in 1967, while another recording by Wayne Newton reached number 88 here the same year. At the time, I had no idea "Love Of The Common People" was a cover - or that five of Paul's six top 40 hits in Australia were remakes. This would turn out to be the biggest of them all. The week's highest new entry comes from a singer who I also didn't realise had some of her biggest hits with other people's songs - including the tune that started it all off for her. That's right, Cyndi Lauper's signature song, "Girls Just Want To Have Fun", was originally performed by someone else. Granted, the track's writer, Robert Hazard, only got as far as doing a demo of it, but it was one of four singles released from She's So Unusual that'd been previously recorded by another singer - each one, a male artist. Cyndi changed the lyrics of "Girls Just Wanna Have Fun" and released it as her debut solo single - she'd previously been a member of rockabilly band Blue Angel. As performed by Cyndi, the song celebrated women - a message that was reinforced by the iconic music video, which featured women from all walks of life, including her mother, Catrine. Then there was the singer herself, with her bright red hair, quirky dress sense and unique vocal style. A true original, Cyndi was unlike anyone else on the music scene and she instantly became one of pop's most recognisable stars the world over. 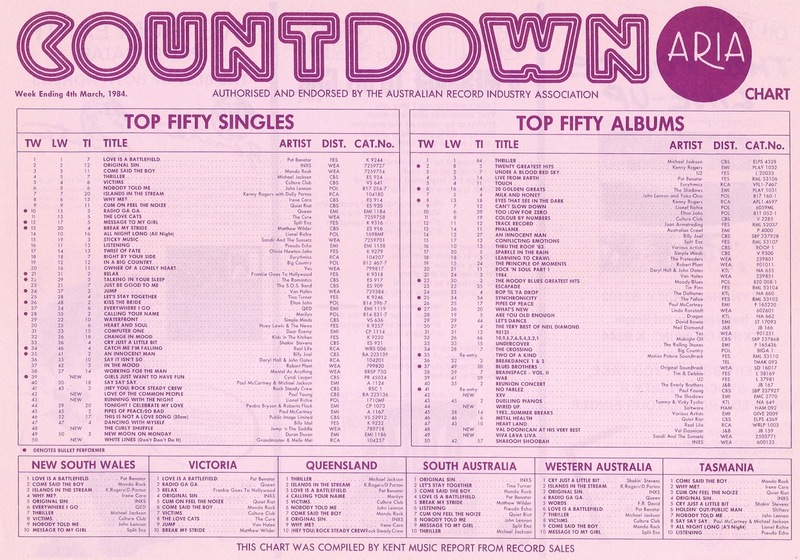 A two-week chart-topper in Australia, "Girls Just Wanna Have Fun" stalled at number 2 in both the US (behind "Jump") and the UK (behind "Relax"). Next week: the final (new) single by one of the biggest bands of the previous half a decade, plus a long-forgotten one-hit wonder. It's surprising that 'Reggae Night' isn't actually a reggae song. The 'White Lines' music video embedded, if that's actually it, re-uses some of the footage from Malcolm McLaren's 'Buffalo Gals'. I didn't know, or had forgotten, 'Running With the Night' until a recent airing on rage. It's probably my favourite Lionel song that I know. The Paul Young track has interesting, prominent backing vocals on the chorus. I loved 'Girls Just Want To Have Fun' (though why was it 'want to' when she sings 'wanna' instead throughout?) at the time, though it has since been overplayed a bit, and I prefer several later singles of Cyndi's. I thought until a year or so ago that she was singing "what in the world can make it stop?" instead of "when the working day is done", which seems much more mundane to me. I actually liked Duran Duran's version of "White Lines", for my sins. Though I can see why people don't like it. "Don't don't do it" means do it, right? Heh-heh.